This synthetic plastic paper material is desktop inkjet printable and is most notably used for maps under several national programs. It is excellent for waterproof and underwater maps, instructions, outdoor surveys, note books or other applications requiring waterproof tag where inkjet inks need to be stable while wet. The caliper is 0.010″. Printable one-side only, 110771 has a removable liner and the sheets are very flexible. We can die cut custom size and shape cards or tags into the sheets, up to 500 sheets in just 24 hours. The Inkjet Printable Teslin is not micro-perforated but actually die cut like labels on a sheet with no rough edges from perforations! 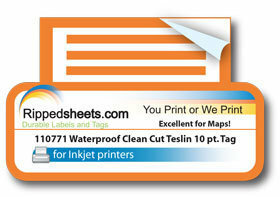 The Teslin tags are in sheets ready for you to print on your inkjet printer. The liner holds the die-cut tags into the sheet. Print quality is excellent on Heavy or Cardstock printer settings. 110771 is excellent for arts and crafts projects, printable invitations, announcements, custom business cards, hang tags, door hangers, business mailers and other card and tag projects. Die cut Tags come flat on a sheet, printable on your desktop printer. You just pop them out of the sheet after printing. You can even print one tag at a time! Teslin resists tearing. 110771 is not available long-run. Please see our Matte Clean-Cut Cardstock Tags for Long-Run quantities.